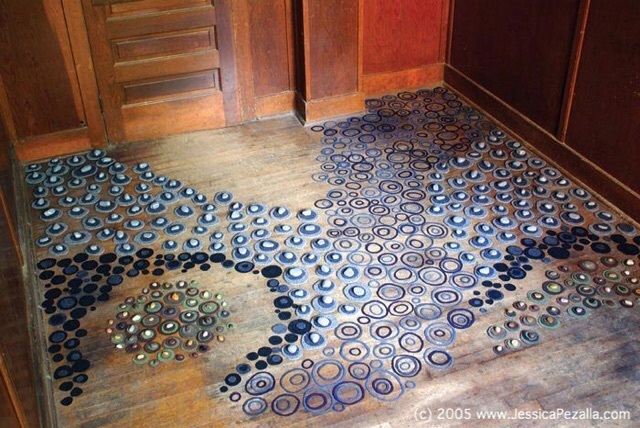 Sculptor and installation artist, Jessica Pezalla, created this delightful art piece entitled: “River” using rocks and cut out pieces of felt and carpet. I love how the whole piece is made with organic and mundane human-made objects. She even created a circular section off to the left, like a little earthen sanctuary hidden just around the corner from the river’s edge. I really appreciate her creativity and imagination. Using ringlets to represent ripples on the river’s surface…brilliant! Her piece inspires me to make a mixed media piece using organic and inorganic objects. What objects are you inspired to use for your “in/organic” piece?